Tabula bathymetrica regionis Lacus Winnipeg. Imago NASA regionis Lacus Winnipeg. Lacus Winnipeg, Anglice Lake Winnipeg, est magnus sed tenuis lacus aquae dulcis, fere 24 514 chiliometrorum quadratorum, in media America Septentrionali in Manitoba provincia Canadae situs, cuius litus meridianus circa 55 chiliometra ad septentriones urbis Winnipeg patet. Qui est maximus lacus intra fines Canadae meridianae. ↑ "Narratio exstat de Indianis in vicinia lacus Winnipeg" (p. 162 apud Google Books). Canadian Action Party. 2006. Canadian action party release Devils Lake ruling. Casey, A. 2006. Forgotten Lake. Canadian Geographic 126(6): 62–78. Chliboyko, J. 2003. Trouble flows north. Canadian Geographic 123(6): 23. Daily Commercial News and Construction Record. 2003. Ottawa asked to help block water diversion project: Devils Lake outlet recommended by U.S. Army Corps of Engineers. 76(198): 3. Economist. 2005. Devil down south. Economist 376(8435): 34. GreenPeace. 2008. Algae bloom on Lake Winnipeg. 26 Maii. Sexton, B. 2006. Wastes control: Manitoba demands more scrutiny of North Dakota’s water diversion scheme. Outdoor Canada 34(1): 32. Warrington, P. 2001. Aquatic pathogens: cyanophytes. Welch, M. A. 2008. Winnipeg’s algae invasion was forewarned more than 30 years ago. The Canadian Press. Macleans. 2004. What ails Lake Winnipeg. Mcleans 117(24): 38. Wilderness Committee. 2008 Turning the tide on Lake Winnipeg and our health. Vicimedia Communia plura habent quae ad Lacum Winnipeg spectant. 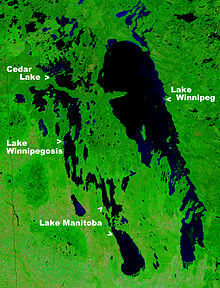 Manitoba Water Stewardship - Lake Winnipeg. Novissima mutatio die 16 Iunii 2017 hora 19:46 facta.